Today we used some of the rhubarb that we have growing in the garden. 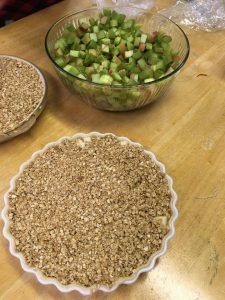 We made two rhubarb apple pies with a crumble on top and rhubarb and strawberry smoothies. We made these in the morning, shared what we made with the rest of the school during lunch time, and cleaned up in the afternoon.